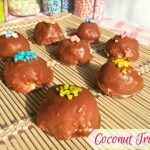 These easy, creamy, amazing, chocolate covered Coconut Truffles melts in your mouth, you can't eat just one! Author Anna @ Anna Can Do It! Whip the whipping cream with the whip it. Slowly fold the whipped cream in the melted white chocolate, then add the condensed milk. Let them cool in the fridge for 15-20 minutes. When the coconut mixture cooled and moldable, form little walnut size balls. Melt the milk chocolate and the coconut oil. Cover the coconut truffles in the milk chocolate with a fork. Put the truffles in the freezer for 5 minutes.